Mike Coughlan has been a racing fan since his father took him to watch a race at Brands Hatch when he was 10 years old. This passion developed into an interest in engineering and Mike won a place to study mechanical engineering at Brunel University at Uxbridge, to the west of London. When he graduated in 1981 he was immediately hired to design for Tiga Cars in Maidenhead. In the early 1980s Tiga - which had been founded in 1975 by former Grand Prix drivers Tim Schenken and Howden Ganley - was producing a variety of different cars in the junior formulae and Coughlan was kept busy at his drawing board until he was given the chance to join Gerard Ducarouge's design team at Lotus in 1984. His first job was to help design the highly-secret Lotus Indycar - codenamed the Lotus 96 - but it was never raced and Coughlan switched to the design team of the Lotus-Renault 97T, which would be driven by Ayrton Senna and Elio de Angelis in 1985. It was this car with which Senna scored his first F1 win in Portugal and which gave De Angelis victory at Imola. This was followed by the 98T with which Senna won two races in 1986 and the 99T which gave Senna two more wins in 1987. When Senna quit Lotus the team's fortunes began to slide: Ducarouge was fired and Frank Dernie appointed technical director. Coughlan was named chief designer. The team lost Honda and the Lotus 101 had to be designed for a Judd V8. The 102 for 1990 had a Lamborghini V12. At the end of 1990, after two difficult seasons, the team's chief sponsor Camel quit the team and the crew split up: team manager Rupert Manwaring going to Tyrrell; Dernie to Ligier and Coughlan to join John Barnard's Benetton Advanced Research Group in Godalming, Surrey. Mike was chief designer of the B191, which would be the forerunner of the successful Benettons of 1992-1994, but Barnard's team at Godalming was short-lived: JB fell out with team boss Flavio Briatore over money and after John left his staff scattered to other teams. Coughlan went to Tyrrell to work alongside chief designer George Ryton. They produced the Ilmor-engined Tyrrell 020B and in 1992 Andrea de Cesaris scored eight points with the underfunded car. When Ryton left at the end of that year Coughlan became chief designer of the 020C, the first Tyrrell-Yamaha, but it was not a success and Coughlan departed in August 1993 to join John Barnard's Ferrari Design and Development operation at Shalford as head of research and development. Coughlan stayed with Barnard when he bought FDD and turned it into B3 Technologies and the pair began working at Arrows in the summer of 1997, Coughlan as deputy technical director. Barnard departed in mid-1998 after falling out with team boss Tom Walkinshaw but Coughlan stayed on as chief designer and was named Technical Director in August 1999 when Egbahl Hamidy was taken on as chief designer. 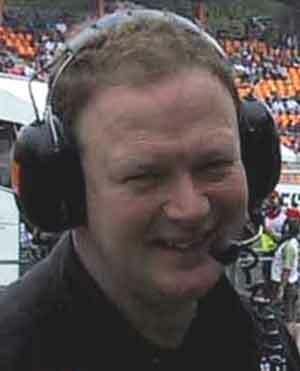 Coughlan led the design team at Arrows until 2002 when he was asked to join McLaren as chief designer. He has been in charge of the design team at Woking ever since.